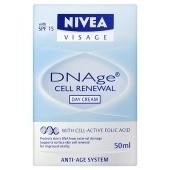 Nivea Visage® DNAge Renewal Day Cream is part of an innovative Anti-Ageing skincare system - consisting of high performing day, night, eye and zone specific care products. The formula with the powerful combination of cell-active Folic Acid and Creatine effectively increases surface skin cell renewal. Enriched with a SPF 15 light filter system with enhanced UVA protection, DNAge helps protect the skin cells' DNA from external damage with regular usage. - Noticeably firmer, smoother skin. - Reduction in the appearance of wrinkles and fine lines. Aqua, Glycerin, Ethylhexyl Methoxycinnamate, Cetearyl Alcohol, Methylpropanediol, Butyrospermum Parkii, Glyceryl Stearate, Butyl Methoxydibenzoylmethane, C12-15 Alkyl Benzoate, Cera Microcristallina, Phenylbenzimidazole Sulfonic Acid, Paraffinum Liquidum, Caprylic / Capric Triglyceride, Folic Acid, Creatine, Tocopheryl Acetate, 1-Methylhydantoin-2-Imide, PEG-40 Stearate, Dimethicone, Chondrus Crispus, Sodium Carbomer, Titanium Dioxide, Ethylhexylglycerin, Trimethoxycaprylylsilane, Trisodium EDTA, BHT, Phenoxyethanol, Methylparaben, Ethylparaben, Propylparaben, Parfum.